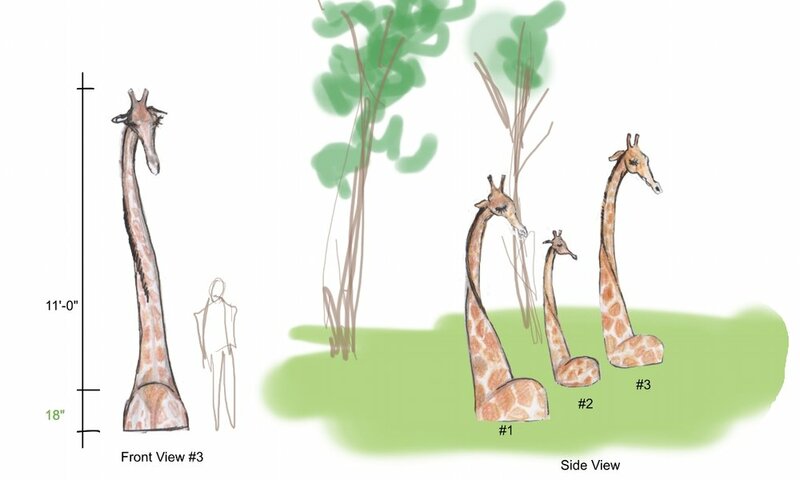 We propose a series of four vignettes, giraffes, elephant, bear, alligators. Each animal represents a stage in conservation status, disappearing/reappearing from view in the landscape. All of the animals represented have seen their numbers decrease to endangered levels and are making a comeback due to conservation efforts. The juvenile elephant, giraffes and black bear are all threatened or vulnerable and we show this by having them in various depths of the landscape. Views can take a seat on the back of the giraffe and gaze out to the Brazos River. We would bring our sense of whimsy to this serious subject through the use of texture, scale and style of execution. The art will be inviting and viewers may interact by physically engaging the art by sitting, climbing, and feeling the textures. The sculptures would be constructed of steel and pva fiber waterproofed hydraulic cement, with integral color and Keim Mineral Coatings and sealers.